Contents: 100% Cotton. Exclusive of decoration. 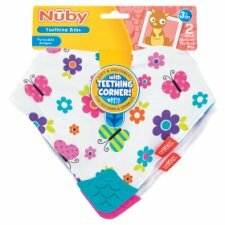 Soft & absorbent for teething & dribbles with teething corner! Care instructions: Wash before initial use and after each subsequent use. Machine wash warm, gentle cycle. Use non-chlorine bleach when needed. Wash dark colours separately. Do not tumble dry. Do not iron. Please read and retain this important information for future reference. WARNING! KEEP AWAY FROM FIRE. Never leave your baby unattended whilst feeding. Ensure adult supervision at all times.